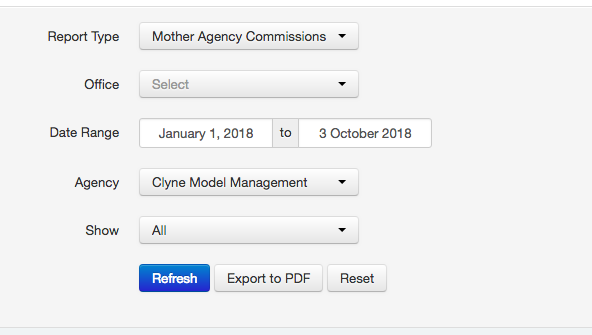 You are only able to create and view Mother Agency Statements if your Syngency account has access to Reports (this requires an Administrators account). Go to the Reports tab in the Syngecy menu bar. 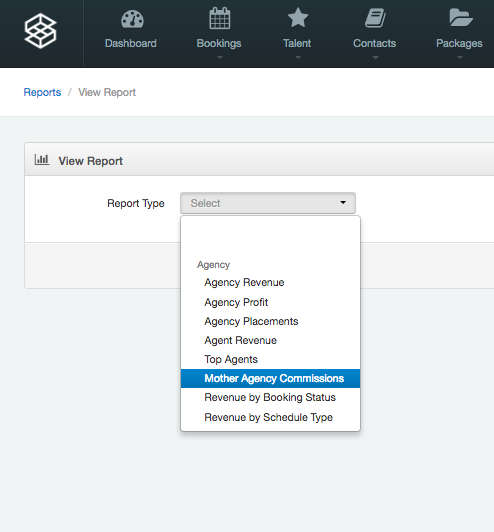 Use the drop down menu to select Report type: Mother Agency Commissions. If you have multiple offices you are able to select which office you are viewing for, unless you wish to view all, then leave this field blank. Use the date picker to select the date range you wish to view. From the drop down menu under Agency, select which Agency you wish to view the Report/Statement for. Here you are able to select if you would like to view All bookings or only Paid or Outstanding ones. Once you have made your selections, click the View Report button on the bottom right of the screen. The page will refresh and generate a Statement showing bookings made by talent who have this agency as their Mother Agency. It shows the job amounts and Mother Agency commission breakdown. This will open a new window in your browser and enable you to dowload and/or print the Statement for easy sending.